It’s been three months since President Trump’s huge corporate tax cuts took effect, which means we’re getting our first look at how sizable these cuts will be for America’s largest corporations. Companies regularly release quarterly financial reports detailing their earnings and expenses (including income taxes) over the previous three months. In reports released over the past week, covering the first three months of 2018, a few of the biggest and most profitable Fortune 500 corporations acknowledge receiving billions in tax cuts in the first quarter of 2018 alone. Fifteen of these companies collectively disclosed reducing their effective tax rates by $6.2 billion compared to the rates they faced in the first quarter of last year. Alphabet, previously known as Google, enjoyed $10.5 billion of pretax income in the first quarter of 2018, and recorded an income tax provision of $1.1 billion. This means the company’s worldwide tax rate, including current and deferred taxes, is 10.8 percent for the first quarter, just over half the 20.4 percent tax rate they reported for the first quarter of 2018. This lower tax rate saved Alphabet $1 billion in just the first three months of 2018. Bank of America reports $8.4 billion of pretax income in the first three months of 2018, up 15 percent from the same period last year. Its estimated tax rate on these profits is 17.9 percent, down from 27.4 percent during the first quarter of 2017. If this 9.5 percent reduction in effective tax rate is due entirely to the new tax cut, that means Bank of America’s first-quarter tax-cut haul from the new tax law is $801 million. AT&T’s first quarter pretax income was $6.1 billion. The 11 percent reduction the company reported in its effective tax rate for the quarter, relative to the first quarter of last year, translates into a $678 million tax savings. Wells Fargo reports $7.5 billion of pretax earnings in the first quarter this year. The effective tax rate on these profits is 18.3 percent. If these profits had been subject to the 27.3 percent tax rate they projected in the first quarter of 2017, the company’s tax provision would have been $662 million higher this quarter. Verizon reports an income tax provision of $1.388 billion on $6 billion of pretax income over the past three months, reducing their effective tax rate from 31 percent (in the first quarter of 2017) to 22 percent. This translates into a $515 million tax savings for the first quarter alone. JP Morgan’s first-quarter pretax earnings skyrocketed to $10.6 billion in 2018, more than a quarter bigger than the paltry $8.3 billion the company raked in during the first quarter of 2017. And because the company’s estimated effective tax rate fell from 22.7 to 18.3 percent, a $470 million tax savings boosted the company’s after-tax earnings even further. Citigroup’s first-quarter pretax earnings are 2 percent higher than last year’s first quarter, at $6.1 billion. But the company’s first-quarter effective tax rate fell from 31.1 to 23.7 percent, meaning the company likely saw a tax cut of $456 million from the Trump plan in the first quarter. This means almost all of the company’s 12 percent growth in net income compared to the first quarter of last year is due to tax cuts. Eight other companies have made disclosures in the past week that show effective tax rate reductions translating to at least $100 million each in tax reductions. These companies include Boeing, American Express, Morgan Stanley, Abbott Labs, Caterpillar, Amgen, Charles Schwab and Lockheed Martin. 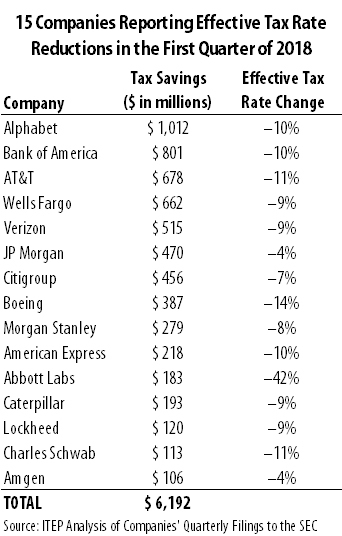 All told, these 15 companies have reported tax reductions totaling $6.2 billion during the past three months. 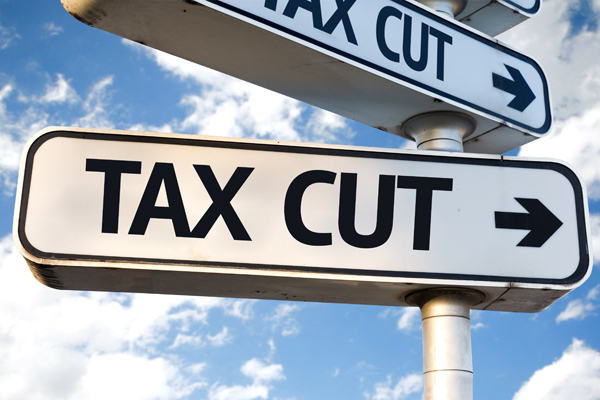 At this rate, these companies could see effective tax rate reductions totaling $24.8 billion during calendar year 2018. It is critical to note that the earnings releases summarized here generally do not explicitly spell out how much of these effective tax rate reductions is due to provisions of the new tax law, and that these quarterly reports represent only a first look at these companies’ economic activity in 2018. For example, AT&T’s CEO estimated in January that the company’s total cash benefits from the new tax law could be as high as $3 billion in 2018, an even bigger number than the quarterly $678 million observed here. Still, these earnings reports are the best available indication of the scope of the tax cuts these corporations will see from the Trump administration’s corporate tax cuts.